The nominee for US ambassador to the United Nations said Security Council authorization should not be necessary for military action. 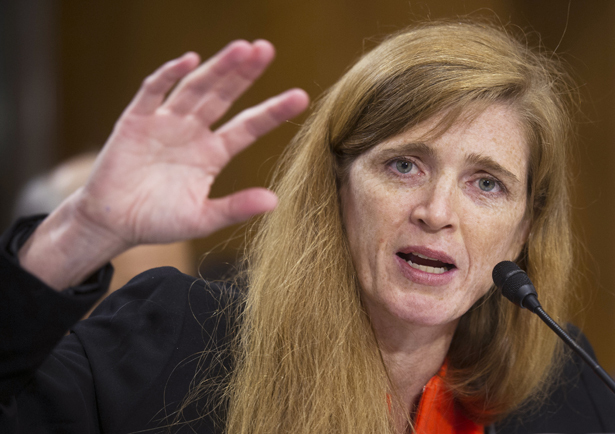 During a confirmation hearing today that was largely a test of her willingness to submit to foreign policy dogma, Samantha Power repeatedly asserted her commitment to “stand up for Israel and work tirelessly to defend it” against the “disproportionate” criticism she said it receives at the United Nations. “I commit to you wholeheartedly to go on offense as well as playing defense on the legitimation of Israel and we’ll make every effort to secure greater integration of Israeli public servants in the UN system,” said Power, President Obama’s nominee for Ambassador to the United Nations, implying that she would support Israel’s bid for a permanent seat on the Security Council. Power said she would oppose Palestinian bids for recognition as a state before the completion of a two-state peace process. Overall, Power suggested that she would approach the UN as if it were at best a rubber stamp for American action abroad and at worst an expensive impediment. That’s what the committee wanted to hear, and Power looks set to sail through confirmation. “I look forward to your service,” said Bob Corker, the ranking Republican on the Foreign Relations Committee. “I look forward to having you go to work as soon as possible,” echoed John McCain. Particularly alarming given the push for military intervention in Syria and Iran was Power’s statement that securing authorization from the Security Council should not be necessary for the United States to take unilateral action. “When US national security is threatened and the Security Council is unwilling to authorize the use of force but the president believes that it is judicious to do so, of course that is something he should be free to do,” she said. When George W. Bush felt free to launch the invasion of Iraq without UN approval in 2003, many experts considered it a violation of international law. Later, Power refused to answer Senator Rand Paul’s question about whether Congress or the President had the power to authorize intervention. Whatever the public statements out of Iran, we have to remember the conditions that gave rise to that election…which were the furthest thing from free, the furthest thing from fair. And I don’t think anybody can say that the election in Iran represented the will of the Iranian people…. Second, I would say that our policy, the administration’s policy, is…verify, then trust. Deeds not words. Again, we have a negotiation track, it is something we want very much to succeed, and we recognize we need to increase the pressure in order to increase its chances for success. And so we call upon the Iranians to engage that process substantively in a way that has not happened to date. Asked if there was further action that the UN could take to move the conversation forward, Power declined to offer specifics. The only real friction occurred between Power and Marco Rubio, who pressed her on comments she made previously regarding the Israeli/Palestinian peace process and the United States’s record on human rights. Power was quick to disavow her response to a hypothetical question posed in 2002 (what should be done in the event that one of the parties in the Israeli/Palestinian were poised to commit genocide), in which she said that such a scenario would warrant the establishment of “a mammoth protection force” and “might mean alienating a domestic constituency of tremendous political and financial import.” It’s a testament to the strength of that constituency and the taboo against criticizing Israeli policy that Powers felt compelled to retract her words. It isn’t surprising that Power had no appetite to stand up to the hawks and the Israel lobby. After all, her task as the Ambassador to the UN will be to represent the interests and policies of the Obama administration, which isn’t effecting much progressive change in the international sphere. That fact is far more discouraging than Power’s submission to the prostration required in the confirmation process. As Arizona Senator Jeff Flake said, pointing out that more often than not the US falls on the losing side of critical votes in the general assembly, “If it weren’t for Israel and Palau and the Marshall Islands, we wouldn’t have any friends.” Power may have won several new ones in the US Senate, but her testimony indicated little about her ability to influence an international community increasingly awake to the shortcomings of US policy abroad. Can restoring the Glass-Steagall Act do what Dodd-Frank failed to do?